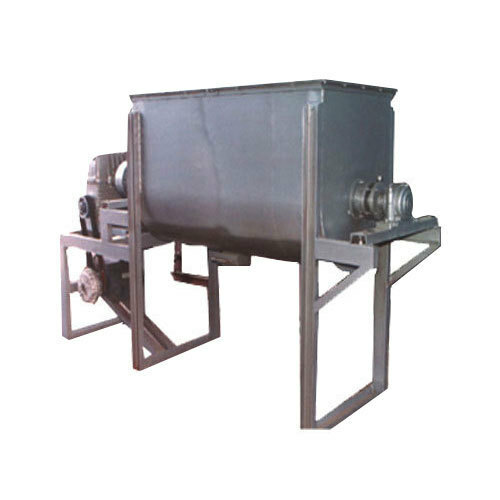 The Ribbon Blenders offered by us are technologically designed to make them useable with dry materials, nevertheless liquid and gas stream can be added. These blenders are developed by using optimum grade stainless steel, carbon steel and alloys along with the incorporation of transmission parts, U-shaped cylinder and double ribbon agitators. In this processing of blending the material by rotation, the outer ribbon pushes the materials from both ends to the center and at the same time, the inner ribbon pushes material from center to both ends. The blending machines have ribbon wind with divergent angles that allow the materials to be carried out in different directions. With the continuous convective circulation, the materials get sheared and mixed thoroughly and rapidly. PM Industries specializes in the design, development, manufacturing and exporting of various equipment used in different Process Industrial units like Food, Pharmaceutical Sectors, Chemical Industries & Steel Industries. We endeavor to provide personalized engineering services to our customers. For this, we also offer our services for complete maintenance, installation and service support for spray drying plant, at the client's location. We provide turnkey pharmaceutical plants, turnkey chemical plants and turnkey steel industry plants. The equipment devised by us are configured, fabricated and designed in confirmation with the client's requirements. The selection of the material of construction completely depends on the varying applications, viz. for food processing, pharmaceuticals, preparing dye-intermediates and others. Our primal strength lies in our ability to combine innovative engineering techniques with upgraded designs.